Come out and see some beautifully decorated homes during the GFWC Brandon Service League's 19th Annual Holiday Home Tour on Saturday, December 3. There are four homes on the tour throughout the area this year. It’s time to deck the halls and get ready for the upcoming holiday season. If you need inspiration on decorating your home, then you should attend the 19th Annual GFWC Brandon Service League Holiday Home Tour on Saturday, December 3, from 10 a.m.-2 p.m. The tour will feature four exquisitely decorated locations in the greater Brandon area. This year, attendees will visit four locations, including the Walden home in FishHawk Trails, the Page home in Creekside in Riverview, the Koren home in Hickory Creek in Brandon and the Ackermans at their beautiful Bed and Breakfast, Casa Lantana in Brandon. Tickets to the Holiday Home Tour are $15 and are available on a first-come, first-serve basis as only 600 tickets were printed. Tickets can be purchased from any league member or at The Green Boutique, located at 1031 Bloomingdale Ave. in Valrico; The Law Offices of B. Lee Elam, located at 101 E. Lumsden Rd. in Brandon; Divine Designs Salon & Spa, located at 1606 Oakfield Dr. in Brandon; and Greg’s Hallmark, located at 863 E. Bloomingdale Ave. in Brandon. In addition to viewing the beautifully decorated homes, attendees will have an opportunity to purchase homemade holiday goodies. 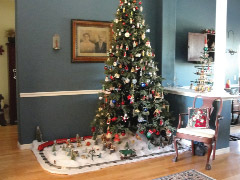 Also new this year, attendees will enjoy refreshments at one of the homes on the tour. Attendees will also be offered opportunities to win several fabulous holiday baskets. The GFWC Brandon Service League is a 501(c)(3) organization whose mission is to enhance the lives of people in the greater Brandon area through volunteer service. The Brandon Service League is a part of the General Federation of Women’s Clubs, which was founded in 1890. The Brandon Service League supports organizations such as ECHO, the Brandon Outreach Clinic, Brandon CARE Pregnancy Center, art departments of six local schools, The Boys & Girls Club of Brandon, Everyday Blessings and the American Cancer Society. For more information, please contact Melinda White at 967-1925 or visit www.gfwcbrandonserviceleague.org.